Standard - $29.99 2X - $29.99 Only 1 left! We know that in many ways, priests are just people like anyone else, and we don’t mean them any disrespect. But since they go to such great lengths to live in accordance with the church’s teachings, we sometimes wonder whether they experience all of the weird quirks of being a human being that the rest of us do! For instance, do priests have dreams about getting halfway through a mass or communion only to realize that they’re not wearing any pants? Or for them, is the imaginary transgression a little less sinful? Do they just forget to wear those little white clerical collars, maybe? And do they have to mention dreams like these during confession? With all of these questions, we can see how it would require so much diligent study and dedication to become ordained. And frankly, we can also tell that we don’t have the patience! 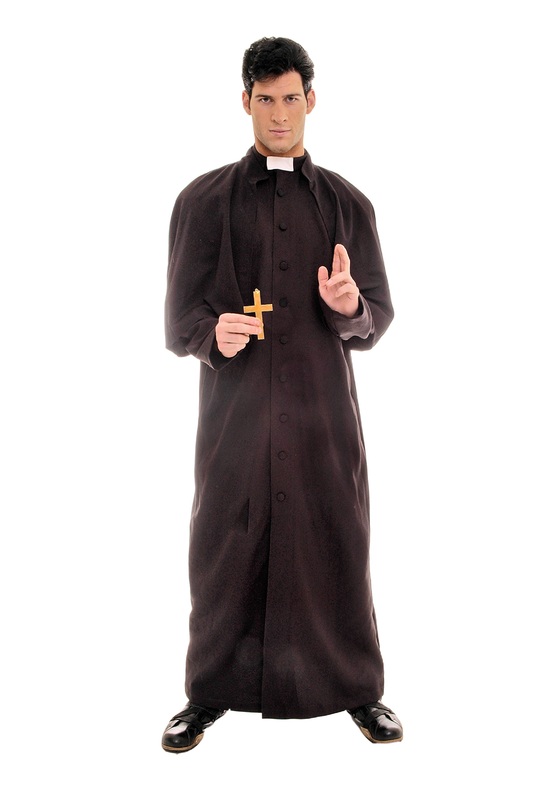 That’s why we offer this Men’s Deluxe Priest Costume: it would hardly be fair of us to insist that other people earn their cassock the hard way when we aren’t willing to do the same. We’re pretty sure there’s a verse in the Good Book about that. Something about a mote and a beam? A speck of sawdust and a plank of wood, maybe? Hey, we’re not carpenters, either! We just want to make sure that everybody gets the costume that they want. And if you want to look like a clergyman without taking any vows, these are the vestments for you! I was disappointed with the quality of the white collar piece attached to the collar. It is a strip of velcro sewn to the outside of the robes collar. It would look better attached to the inside. The buttons are on the left side. If this is a man's robe they should be on the right side. I would not buy this again, but it looks like a costume but not delux.